The record of a man who has achieved success is always interesting, and when the upbuilding of his life is due to real ability, honestly applied, the record becomes instructive. Bradford Rhodes was born in Beaver County, Pennsylvania, February 25, 1849, son of William and Mary Maria (Baird) Rhodes. After acquiring a good common school education, he added to his income by teaching school in winter, continuing to work on his father's farm in summer. This enabled him to improve his education still further by attending the Beaver Academy, and soon after his graduation he became principal of the Darlington Academy, an old-established educational institution of Western Pennsylvania. In 1872 he went to New York a perfect stranger, without a friend or even an acquaintance in the city, and soon engaged in newspaper work, first as a reporter, and later in the business department of the Daily Commercial Bulletin. Afterwards he established The Safeguard, a publication devoted to the interests of savings banks and their depositors. It was widely circulated, and in a short time achieved such success that he determined upon issuing a monthly magazine representative of general banking and financial interests. In pursuance of this purpose, he brought out Rhodes', Journal of Banking in 1877, and it soon became the leading bankers' periodical in the country. In 1895 Mr. Rhodes purchased The Bankers' Magazine, the oldest financial publication in the country, and consolidated the two periodicals under the title of The Bankers' Magazine, retaining the name of his original publication, "Rhodes' Journal of Banking," as the subtitle. He brought the publication up to a high standard of excellence during his connection therewith, until it came to be recognized as an authority in the field of banking and financial literature. As hereinafter stated, he is no longer connected with the magazine, devoting his entire time to the banking business and his other interests. For three successive terms, in 1888, 1889 and 1890, Mr. Rhodes was elected to the New York Legislature, where he established a reputation as a conscientious and painstaking member, his work as chairman of the Committee on Banks and Banking, which he held during his three terms, gaining for him especial distinction for the knowledge displayed in regard to such institutions and iheir important relations to the business interests of the State. While chairman of this important committee he was instrumental in effecting some desirable amendments to the banking laws, and also introduced and secured the passage of the law against bucket shops. His record in Albany as an able and clean-handed legislator brought him into such prominence that, in 1892, he received the unanimous nomination for Congress from the Sixteenth Congressional District, but he declined the honor owing to the fact that his large and increasing business demanded all his attention. 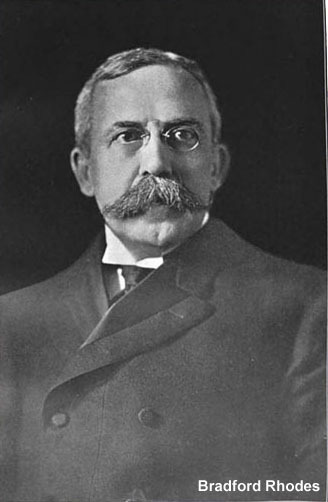 In the early part of 1903 Bradford Rhodes sold his publishing business, after a successful record of twenty-six years, in order to devote more attention to the Thirty-fourth Street National Bank of New York, a new institution organized mainly by his efforts, and opened for business in October, 1902. As president of the bank he gives it the benefit of his wide experience, conservative business methods and tireless energy. At this writing (March, 1904), the bank has been in existence only sixteen months, but already it gives evidence of being a gratifying success. Mr. Rhodes is president of the Union Savings Bank of Westchester County, at Mamaroneck. The institution was organized in 1887 by a number of the public-spirited citizens in Mamaroneck and vicinity, and it is regarded as one of the strongest savings banks in the State. It now has over sixteen hundred depositors. In 1891 the Mamaroneck Bank was organized by Mr. Rhodes and his associates, he becoming president, and in 1901 it entered the national system under the title of the First National Bank. The bank is conservatively managed and has had marked success from the start, paying regular dividends and adding to its surplus year by year. Active in the organization of the New York State Bankers' Association, Mr. Rhodes has twice been chosen chairman of Group VI., and he has always been prominently identified with the progressive work of the association. Mr. Rhodes is also one of the best-known members of the American Bankers' Association, having wop. the exceptional honor of being twice elected a member of the Executive Council, the governing body of the association. There are but few men having such a large and valued acquaintance among the leading bank officials in all parts of the country. He is a tireless worker, or as he himself expresses it, "keeps everlastingly at it," and to this one trait in his character he attributes his success in life. In the broadest sense of the word, Bradford Rhodes is a self-made man. He is best of all a firm friend and safe adviser, and has in an eminent degree the characteristics which go to make up a successful business man and an able bank official. Mr. Rhodes is connected with many business and social organizations, being a member of the Union League Club, the Chamber of Commerce of the State of New York, the Sons of the American Revolution, the Larchmont Yacht Club, the Republican Club of the City of New York, and the Transportation Club. He was married, February 27, 1878, to Caroline Augusia, eldest daughter of James M. Fuller, who was a wellknown banker of New York. Mr. Rhodes resides at Quaker Ridge Farm, near Mamaroneck. The location of the place is one of the most desirable in the historic county of Westchester, commanding a fine view of Long Island Sound.